Despite the utmost importance of listening to your mix, looking at it is also necessary. Meters are the visual aids for decision making. They divulge clipping and other undesirable content that is too subtle to hear during production but may become obvious after compression. There are many types of meters used in audio. Perhaps the most useful are peak and VU meters. As you probably already know, there is a specific difference between amplitude and level. Simply put, the amplitude is bipolar and level is the absolute magnitude (See Blog: Loudness and Level). Level is used in metering because, as far as incoming signal, the audio engineer/producer is really only concerned with one thing – that it does not exceed the limit of their system. It does not matter whether the voltage is positive or negative at this point. All that matters is its distance from 0. Voltages and digits are useless to audio engineers because we don’t have the sensitivity to level changes that the computer does. 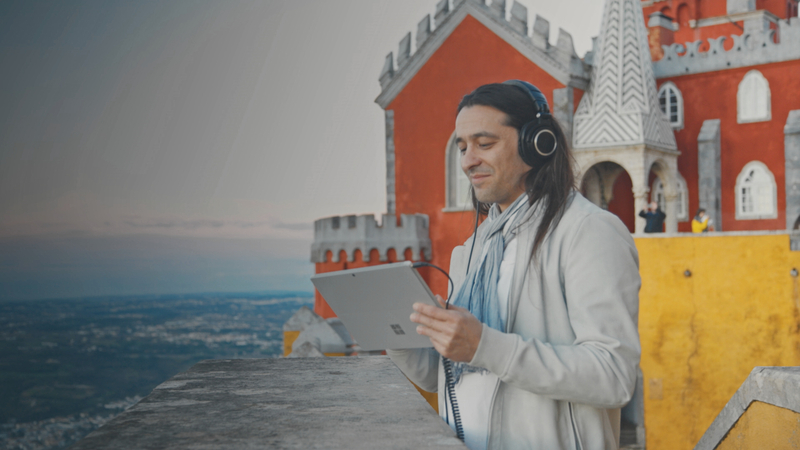 Make no mistake, our ears are VERY sensitive; but, our just noticeable difference (JND) for level is 1 dB – not even close to a computer’s sensitivity. The two sounds below from Loop Master’s Kate Wild sample pack are separated by the JND. Imagine trying to tell the difference between them with less change than this. The dB scale was implemented for practicality. It describes a ratio of intensities (intensity compared to a reference) rather than a raw linear value. The limit of most professional audio equipment is 1.23V and the limit of most audio sequencers is a sample level of 1. Both of these numbers are usually noted as 0 dB on the interface. This does not necessarily mean there will be clipping if you push the level higher than 0 dB. Most equipment and software has some built-in headroom. This type of meter displays the level of the signal immediately as it changes. They show a word-for-word, if you will, level analysis as signal flows. Its reading is identical to the signal level. They are ideal for making sure a signal is not exceeding a specific limit. However, they do not reflect the way we perceive loudness. With this being said, they can provide a more useful reading than other meters for sources like resonant percussion. This is because, in these types of sources, the decay time is way longer than the attack. Yet, the decay has way less impact on our perception of the source’s loudness than the attack does. Humans perceive loudness as an average rather than a sequence of peak levels. Here lies the disadvantage of peak meters – they do not reflect our senses. So, a number of averaging mechanisms have been invented to do so. These mechanisms range from mechanical RC circuits that slow down the needle to features in the digital domain like route mean squared (RMS) to the studio engineered VU meter. Route Mean Squared (RMS) – repeatedly generates an average level by squaring all values (to make everything positive), taking the mean (average), and taking the square root of that (to undo the multiplication from the first step). 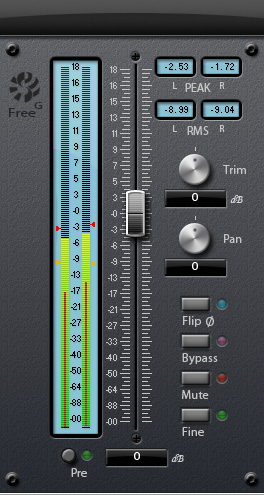 The plug-in below from Sonalksis is called FreeG Stereo. It features both peak and RMS metering. The red meter/hold indicators represent peak levels and the greenish-yellow meter/hold indicators represent RMS (average). 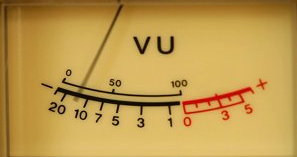 VU Meters – This is the most popular type of meter – the inspiration for RMS. It exists in the mechanical realm as well as in software emulations. They are scaled such that the user has more room to see changes in moderate and loud signals than in lower level increments. The green bar at the bottom is the correlation meter. If your goal is to make the channels the same (mono), you want to achieve a position of +1 (far right). However, If you wish to make the channels completely out of phase, you want to achieve a position of -1 (far left). Lastly, If you want to make the channels completely different (stereo), you want to achieve a position of 0 (center). 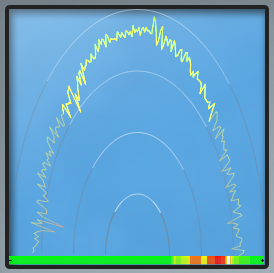 The graph displays the distribution of energy throughout the stereo image. You can use this to divulge certain width imbalances you have been hearing. Notice the percussion in the first example below is a bit unfocused, but more clear and tight in the second example. In general, a healthy mix/sound lies somewhere between 0 and 1 on a phase meter. Readings below 0 may indicate a problem unless of course, it is your intention to induce phasing (See Blog: Phase and Phasing).